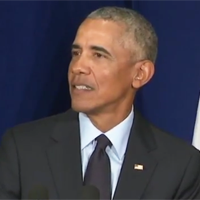 Obama tells young people: "Don't binge on whatever it is you're bingeing on"
The former president gave his most pointed speech since leaving office Friday, urging students at the University of Illinois to vote in November's midterms -- and to avoid binge-watching. Obama's comments come four months after he and wife Michelle Obama signed a production deal with Netflix, the company most identified with binge-watching. "Don't hashtag. Don't get anxious," he said. "Don't retreat, don't binge on whatever it is you're bingeing on. Don't lose yourself in ironic detachment. Don't put your head in the sand. Don't boo. Vote! Vote!"